View this fun resource HERE! Great for morning work, homework, or center time. This May pack includes 54 pages. There are 27 May related pictures for students to unscramble the sentence at the bottom of each page by cutting the words out and gluing in the correct order to tell about the picture. There are 2 pages of each picture making the pack 54 pages. 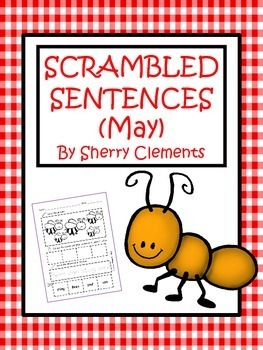 The first page with each picture has the “unscramble the sentence” activity and then students are to TRACE the sentence that matches the unscrambled sentence in the box. The second page with each picture has the “unscramble the sentence” activity, but then there is a blank box for students to WRITE the unscrambled sentence on their own (no tracing like the first page for each picture). All of the graphics relate to insects and plants (planting). The PREVEIW shows every page included. The ants walk in a line. The moth likes the light. We will plant the seeds. This is my garden bag. The butterfly likes the flowers. The girl is planting flowers. We have some pink flowers. Where is the watering can? We plant seeds in the dirt. It is a pretty day.